A British government department has spent more than £100 million on ferries to ease potential problems in the event of a no-deal Brexit. 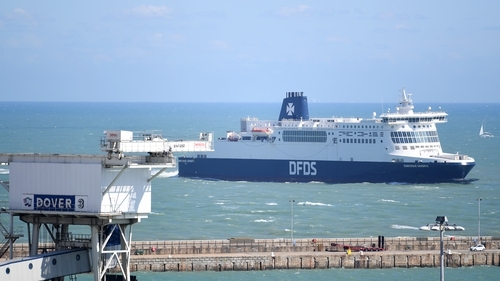 The Department for Transport (DfT) has signed contracts with French firm Brittany Ferries, Danish company DFDS and the UK's Seaborne to ease pressure on Dover should Britain leave without a deal. The move would allow for almost 4,000 more lorries a week to use other ports on England's south coast to prevent a bottleneck at Dover. The additional crossings are understood to be the equivalent to around 10% of the current traffic on the Dover Strait and will see ports in Poole, Portsmouth, Plymouth, Immingham and Felixstowe used. The BBC reported the value of the contracts is £107.7 million - £47.3 million to DFDS, £46.6 million to Brittany Ferries and £13.8 to Seaborne Freight. A spokesman for the DfT said: "This significant extra capacity is a small but important element of the Department for Transport's no-deal Brexit planning. "While remaining committed to working to ensure a deal is reached successfully, the department is helping ensure the rest of Government are fully prepared for a range of scenarios, including a particular focus on a potential no-deal and to mitigate the impact of any Brexit outcome on all transport modes." Liberal Democrats party leader Vince Cable told the BBC that the move was "complete madness". "The fact that this money is predominantly going to European companies is nothing short of ironic, reducing Britain to a laughing stock on the global stage."